This place was perfect for our family of three! There was a little fridge, stove, water cooker, some dishes, and it was certainly cozy. Also, lots of natural light!The location was perfect and the reception was incredibly friendly. I would certainly recommend this place and will hopefully stay again! The young girl at the desk at the end of our stay was most helpful and knowledgeable. Excellent employee. Staff was super friendly, helped us out with any info that we requested, even upgraded our room free of charge!! 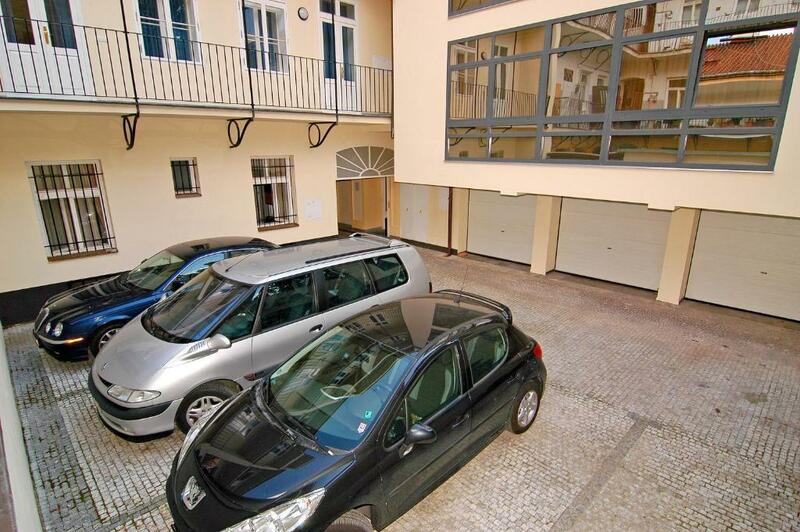 Parking is available at a fair cost per day and the location couldnt be any better, about a 5-10 minute walk to almost anything in the city center!! Also very quiet street right in the middle of everything! Francesco thank you so much!! The room was spacious and comfortable. Some tools in the kitchen that are missing, no microwave which is essential in an apartment. The reception was very good and she explained most of the locations near by and everything you need. The tram and metro are very near the apartment. There is an shopping centre near by, quiet place, except the an noise bar near by. The location was excellent. Walking distance to all attractions. The staff very friendly and helpful. I asked them for a plug adaptor and they gave it to me without any deposit. They had 10% off for 2 restaurants. The room was nice n clean n spacious with lots of storage space. They had an electric kettle with cups but no tea or coffee. It's in a great location and the room was simple and clean. Lock in a great price for Ai Quattro Angeli – rated 8.4 by recent guests! Ai Quattro Angeli This rating is a reflection of how the property compares to the industry standard when it comes to price, facilities and services available. It's based on a self-evaluation by the property. Use this rating to help choose your stay! 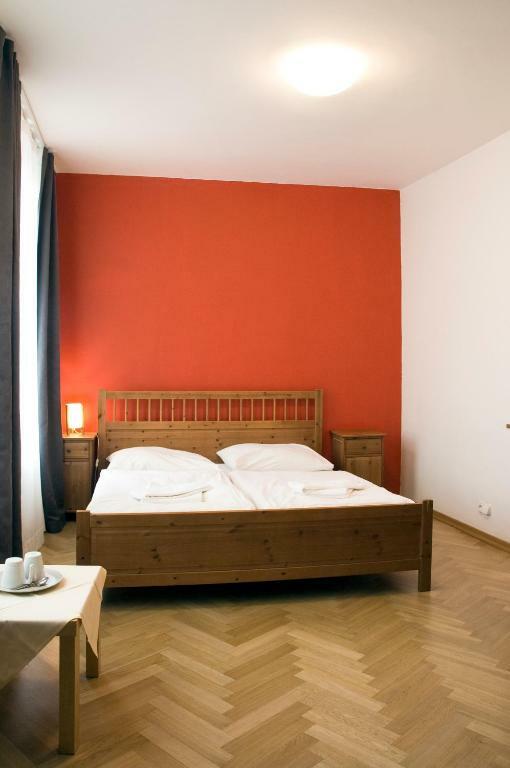 Located 2,300 feet from Prague’s historic town square, this residence with hotel services offers fully furnished apartments with free internet. Each bright and parquet-floored apartment is accessed by a private entrance. Ai Quattro Angeli’s apartments feature a full kitchen and a dining area. The bathroom comes with a bathtub and bidet. The staff can arrange guided tours in Prague or airport transfers. Car rentals and an ironing service are also available. The Residence Ai Quattro Angeli is just 500 feet from the Narodni Trida Metro Station and Tram Stop. 뀐 Located in the real heart of Prague, this property has an excellent location score of 9.1! When would you like to stay at Ai Quattro Angeli? Studio with large double bed which can be converted into 2 single beds. Also includes private bathroom with bathtub or shower and kitchenette. Bedroom with a sitting area, separate kitchen and bathroom. Spacious apartment featuring a separate living room with sofa bed. Room with satellite TV, free Wi-Fi and a bathroom with a shower. A washing machine and ironing facilities are provided as well. The idea was to create an ibrid property between an Hotel and a classical Residence giving services usually you´ll not find in a self catering apartment, like reception, and simultaneously a situation where you can choose between complete privacy and full assistance for plan carefully your stay . After many years passed abroad (UK, Spain, Switzerland) I´m now focused to pour my experience full time to host and make your holiday a unique experience. Prague is full of life all year long and here I can satisfy my hunger of culture. A few seconds or minutes walking from our residence, that anyway is located in a peacefull street, you can find disco bars, tipical bars where usually the czech meets for have a good beer after work, breweries (U Fleku, the oldest in Prague is 20 seconds walking from us) or shopping center. Old town Square is 10 minutes walking slowly or the National Theatre is 3-4 minutes far. House Rules Ai Quattro Angeli takes special requests – add in the next step! Ai Quattro Angeli accepts these cards and reserves the right to temporarily hold an amount prior to arrival. - pick up the keys at the front desk of a hotel located in front of the accommodations and late check-in will be provided for a surcharge of EUR 5. Please note that check-in and key collection take place at: CERNA 15, PRAGUE 11000. Please inform Ai Quattro Angeli of your expected arrival time in advance. You can use the Special Requests box when booking, or contact the property directly using the contact details in your confirmation. This hotel is in a great location. It’s in a quiet back street but walking distance to everything. It could do with a restaurant or cafe. Excellent location. Beautiful apprtment. Value for money. Quanit property done up classily. Old building and wodden furniture. Some furnishings are a little worn out but still OK. Staff is extremely polite and helpful. The buffet breakfast is awesome and the spread is lavish. Lovely location not too far from attractions. Only a few tram stops from Nyugati and quite near Kaleti also (5/6 Euro by taxi). Hotel does cab bookings at no extra cost. Mattress is in bad shape, it was suppose to be changed few years ago. Also internet connection was very bad. I was not able to do anything online. Close to the center of the town. Unfortunately our bedroom backed onto the pub next door which closed at 3am (even on a Sunday and Monday) which meant we couldn’t get to sleep until after then. This is the same for two downstairs apartments on one side, numbers 1 & 3. Location was fab, room was clean and use of a fridge and hob a bonus. Well, I was looking for an honesty-priced accommodation. Actually the price was fair, however the overall experience was disappointing. The place (room 2) was a bit bad smelling. I got a room at ground floor, just one window between my bed and the road. Then.. free of charge, a pub just behind my head. Yeah, the music from the pub was great but I would have preferred a better sound isolation instead of a non existing one. What can I say ? Honestly-priced but a bit malodorous and noisy. Honestly priced accommodation. Five minutes walk from public transportation (tram, underground). Shopping center with food court nearby. the location is close to all the fun places you need to visit while in Prague, quiet. All attraction within walkin distance. Rooms were a decent size and very clean. Staff helpful. Location was ideal if you were after somewhere quiet, only a few minutes walk to square.